— Ancient Sanskrit Vedas, 2000 B.C. 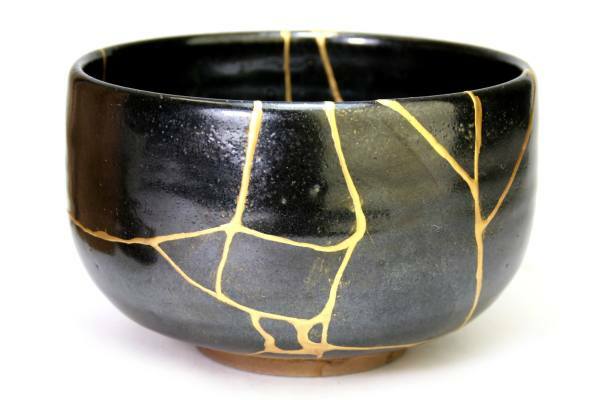 The Japanese developed an art form they call kintsugi. When something breaks, instead of tossing it out as broken, as waste, kintsugi not only repairs the valuable broken item, but beautifies it by placing the pieces back together and embellishing the cracks with precious metals like liquid gold or silver. The embellished cracks serve as a reminder of the object’s continued value despite its scars; the essence of resilience. In much the same way, learning folk skills fosters the art of individual resilience. Knowing how to grow food, how to sew clothing, to build, when to fix and to ferment; these are personal ways to respond to global issues. To have less reliance on the increasingly precious raw resources and fragile global trade system, and more self-sufficiency from local resources. In changing times, how we adapt is critical. The mission of Homer Folk School is to empower people to take an active part in growing their own food, building their own shelter, and creating functional beauty in their homes. To put that knowledge back into the lifeblood of people’s hands could help to create a new culture; a culture of thrift, empowerment, and locality, underpinned by a cyclical awareness of Earth’s natural seasons. Laborious folk skills reduce the tasks of life down to simple base elements, and in that slowing down, in that simplicity, an expanse seems to arise; a place for thought, slow and methodical. Craftsmanship fosters a certain attitude towards the shaping of raw materials. A farmer saving her seeds, a boat maker crafting the perfect canoe from cedar, a hand spinner weaving cashmere wool, a butcher tastefully choosing prime cuts, a carver and his knife. Beyond just practical skills, folk skills are a way of taking a stance towards the things we use to live: food, shelter, and clothing. Contrary to mass technology, losing oneself in craftsmanship is to return to a world of deliberateness. The satisfaction that arises from raw materials and tools skillfully used fosters reverence. Using them sustainably and repairing them lovingly, the master aims to reflect an essence of quality. And this aspect of quality is perhaps ultimately what we seek deep down; a reorientation of basic values, of what we consider wealth, and what we consider waste. In that sense, folk skills are much more than skills from a bygone past, safety tucked away into the recesses of history while we sit comfortably in the modern present. They are far more than that - they are a stance towards life, an approach towards the resources and materials we use to stay alive. They are timeless tasks, the tasks of sheltering, clothing, and feeding ourselves, and the way that we choose to solve those tasks, and who we affect along the way, is what makes us human. It could be our duty, the largest calling in these changing times, to take look at the gently creative and sustainable communities we can - and may have to- create.